Real Estate Sales on Seattle's Eastside Are The Best in Years! The Seattle-eastside real estate market is only getting better and better! August home sales beat July and were way ahead of last August. This August was one of the best real estate markets in years! Real estate sales were hopping. Thirty-three percent more homes received accepted offers this August than August of 2010. Almost 20% fewer homes were on the market, so less supply + more demand equaled more sales. In August, 22% of the homes for sale on Seattle’s eastside got offers. This means out of the 2811 homes for sale, 609 homes sold. On average, most homes sold within 85 days. In King County, the number of homes for sale dropped below 10,000 for the first time since last May. Here on the eastside, we’re also seeing the lowest number of homes for sale. More than likely, the peak number of homes for sale was 2879 back in June. Last month I questioned whether the surge in real estate sales would continue because of the volatility in the stock market. With August sales numbers, we’re seeing the most robust market we’ve seen in a long time. The stock market didn’t put a damper on eastside home sales. July, 2011 Seattle-Eastside Condo Sales-The Best for the Year? July, 2011 condo sales hit the highest number of sales in more than a year. There were 1063 condos for sale on the eastside, 76 less than June, and 250 of them received offers. Twenty-three percent of the condos for sale had accepted offers, great odds when compared to the odds of selling just a year ago. As you can see, there are so many less condos for sale now, almost 1/3 less, and more are selling this year than last. Although, the odds of selling a condo are far stronger than the last few years, there are a number of the sales that didn’t come together. 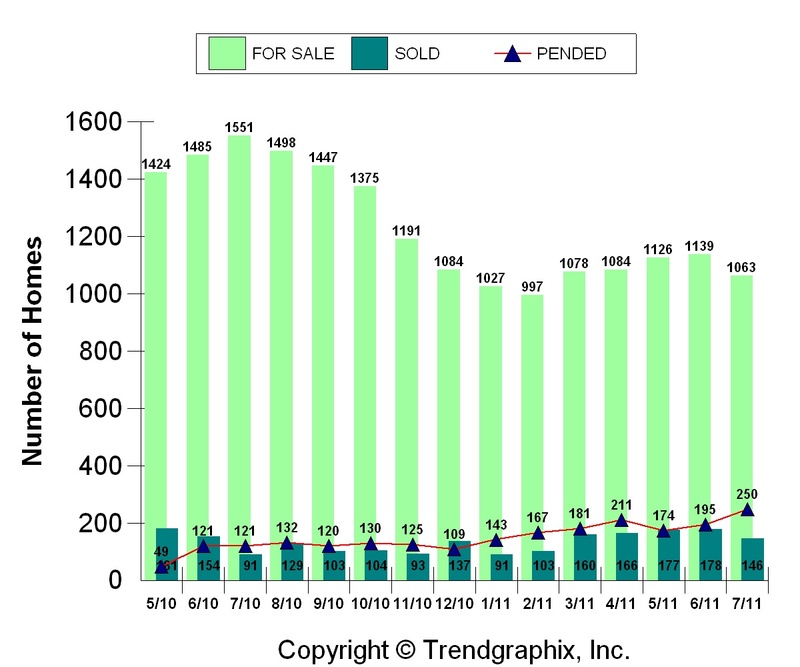 I had reported 223 sales in June and looking at the chart now, I see there were only 195 condo sales. This means 28 sales or 13% failed last month. Sales fail for many reasons. A condo may not pass inspection or an appraisal. The buyer may not get financing or the condo complex itself may not fit financing guidelines. There could be too high a proportion of renters as compared to home owners or there could be a pending lawsuit, both could affect the ability to obtain a loan on a condo in a particular complex. August began with the economy and the volatile stock market hanging over our heads. It’s too soon to see how this will affect our real estate market. How are condo sales going in your area? The chart above speaks for itself. July real estate sales were going strong on Seattle’s eastside. More homes sold in July than in any month since May, 2010. Will this surge in real estate sales continue? Since the news regarding the stock market from last week, it remains to be seen if August will hold up to the sales growth we’ve seen since December of last year. The number of properties for sale in King County still remains low compared to the last few summers when King County had over 14,000 properties for sale. As of August 8th, there were 11,091 properties for sale in King County. Here on the eastside, there were 2863 available properties. If you compare the number of homes for sale on the Eastside this July to last July, there were 17% less homes and condos on the market this year. In July there were 2863 homes for sale and 646 of these homes received offers and sold. The absorption rate, the number of homes that sold during a month compared to the number for sale, was 22%. But what’s also important to note is 12% of the sales from June failed. I had reported 661 sales in June, but this month I see only 587 of them stayed together. The bottom line is more homes are selling than previously, but it’s also hard to keep the sales together. Failed sales can be the result of poor inspections, trouble with the buyer’s financing, an appraisal that does not agree with the sales price or a buyer getting cold feet and backing out. How is the real estate market doing in your area? Do you see similar trends? June was a great month for Seattle eastside condos sales. There were 223 condo sales, the most in any month for this year. April of 2010 was a stronger month for sales, but the numbers were inflated by the end of the 2010 tax credit. Buyers were scrambling to buy a condo before April, 30th, 2010. The number of sales this year show a more realistic picture of buyers wanting to get out there and buy without feeling any pressure because of a tax credit. There were 1140 condos for sale on the eastside and 233 of them received offers. This means that 20% of the condos for sale had accepted offers, pretty good odds, considering the odds over the last few years have been more like 10-14%. But that also means that 80% of the condos did not sell, so price and condition are still extremely important to getting a condo sold. Know the competition when putting a condo up for sale. Make sure the market is monitored on a weekly basis to keep up with the changes in the competition. It’s important to remain competitive the whole time the property is on the market and the market can change quickly. If you plan to sell your condo in the near future, feel free to contact me if you have questions about what you need to do to get ready to sell. Every seller has to do a few things before putting a home on the market. If your home is positioned properly, it can be one of the lucky ones to get an offer. 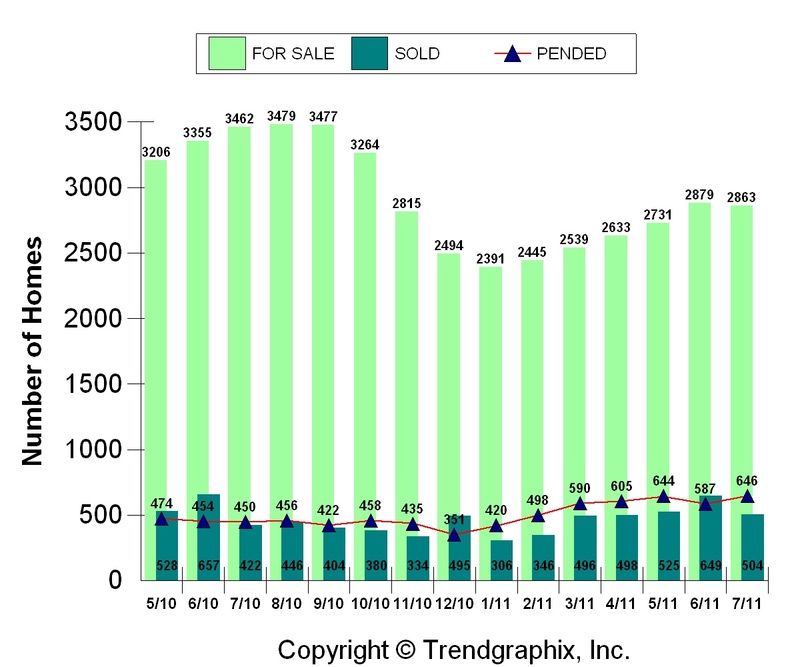 How Strong Were June, 2011 Real Estate Sales on Seattle's Eastside? 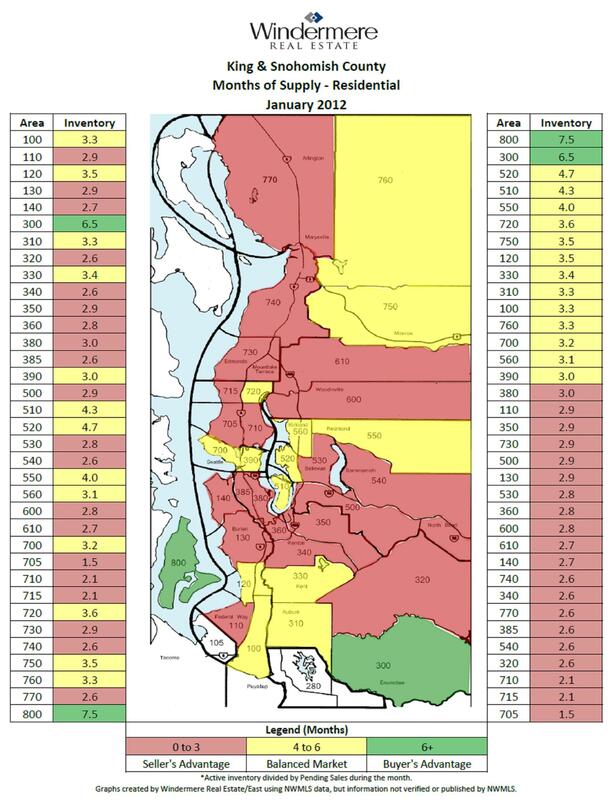 How strong were June, 2011 real estate sales on Seattle’s Eastside? This summer’s real estate market is going to stay stronger than what we usually see during a Seattle summer. Traditionally, the highest number of homes for sale during a year comes near the end of July. With this increased competition, it can make it more challenging to sell your home. Although the number of eastside homes for sale has increased each month, the increase is nothing like the numbers we’ve seen during June of the last few years. This year, the number of homes for sale is increasing, but at a much slower pace than last year. In King County as a whole, there are 11,320 properties for sale. Last year at the end of July, there were 14,639 properties on the market. This translates to 33% fewer homes on the market in King County this year. On the eastside, there were 15% less homes for sale in June. Since there’s still a great selection of homes for sale, the smaller number of available homes increases the odds of a home selling. In fact, we had multiple offers on two listings this week alone. I find we have a lot of showings on our listings, so buyers are definitely out there more than they usually are in the summer months. The number of sales this past month dipped a little from the previous month, but only by 12 homes. In May, we saw the highest number of homes sell in a month so far this year. As a reminder, in April of last year, there’s a very high number of home sales. This was artificially high as buyers tried to “cash in” on the tax credit. This year, the sales numbers are not inflated by any other issue. Real estate sales are fueled by the amount of job hiring in the area and by buyers who are more willing to move on with their lives, literally. In June 2011, there were 2880 homes for sale and 661 of these homes had offers. The absorption rate, the number of homes that sold during a month compared to the number for sale, was 23%. Almost one quarter of the Seattle eastside homes for sale sold in June. How is the real estate market doing in your area? Is it as strong as what we’re seeing here or is a little slower. How Many Real Estate Sales Were in Your Seattle Eastside Neighborhood in May, 2011? How many homes sold in May, 2011 in your neighborhood? May real estate sales are proof again that real estate is local. Seattle eastside real estate is doing relatively well when compared to the last few years and to other parts of the country. Regardless of what the national news reports about real estate, Seattle area real estate sales are better than most parts of the country. In most eastside areas, roughly 1/4-1/3 of the homes on the market sold. In some areas of the eastside, such as East Bellevue, Redmond near Microsoft, and Kirkland, more than 30% of the available homes sold. These areas tend to shine, particularly East Bellevue and Redmond, near Microsoft. These neighborhoods have a mix of housing styles and prices and are located close to good schools and jobs. The areas that are further out tend to be on the slower end of the sales spectrum. More home buyers in today’s market are looking for the convenience of living close to amenities. I also should qualify my statements regarding the market. Prices are not up, but remained stable in some areas and lost ground in others. Seattle’s eastside has a “normal” real estate market when considering the market over the last few years. A “normal” market means everything is happening from homes selling the minute they hit the market to homes taking months to sell and at reduced prices. The “hot” homes are selling. “Hot” homes are great values with a good price tag, are staged and ready to go. The homes that are not “hot” are taking a long time to sell and go through several price reductions before getting an offer. While the rise in pending sales was more modest on the Eastside, King County’s priciest area, closed single-family sales in May actually were up 6 percent from the same month last year — bucking the countywide trend — while prices fell just 4 percent, less than half the countywide drop. Windermere’s Deasy attributed that in part to hiring by major Eastside employers. “People will start to see houses sell before they have a chance to act on them,” he predicted. Eastside condo sales also were up from May 2010, climbing 15 percent. Countywide, however, condo sales fell nearly 4 percent, and the median price — $215,000 — was down 14 percent. Median sales price dropped: $559,880 to $487,000. There were 752 homes for sale. A total of 186 homes sold. Median sales price decreased to $409,000 from $480,000. Median price decreased from $624,975 to $538,000. 342 homes were for sale. A total of 113 homes sold. The odds of selling a home were 28%. Median price was down from $451,126 to $375,000. 541 homes were for sale. A total of 177 homes sold. The odds of selling a home was 30%. Median price decreased from $575,000 to $538,500. 282 homes were for sale. Median pricing increased from $1,280,000 to $1,350,000. 167 homes were for sale. A total of 51 homes sold. Median pricing decreased from $519,950 to $411,950. 325 homes were for sale. A total of 74 homes sold. How Many Condos Sold on Seattle's Eastside in May, 2011? Seattle eastside condos sales dropped a bit from April’s high, but sales were still strong. Condos are still selling better than they have in the last few years. The number of condos for sale has increased slightly each month since January, but the number is still really low when compared to last year. There were 1126 condos for sale on the eastside and 207 of them received offers. Eighteen percent of the condos for sale had accepted offers. May’s odds of selling were far better than any month during all of 2010. But the odds were still slightly less than 20%, so it’s very competitive out there. Price and condition are so important. Buyers still have a lot of choices and are generally not in a rush to buy, so if you’re selling your condo, be careful to keep up with the changes in the market. Make sure to get an update on any competition at least every 2 weeks. Too much happens during a month’s time to wait 30 days to look at the competition. Your condo could get left behind, if better priced homes are up for sale.